Habit: Annual, bristly, generally hairy; hairs branched, nonglandular. Stem: erect. Leaf: generally 0 below, alternate, simple, linear or oblanceolate, teeth 3--5, at tip, each with 1 bristle, basal teeth of upper leaves reduced to clusters of 2--3 bristles. Inflorescence: terminal, head-like; bracts leaf-like; pedicels 0--short. 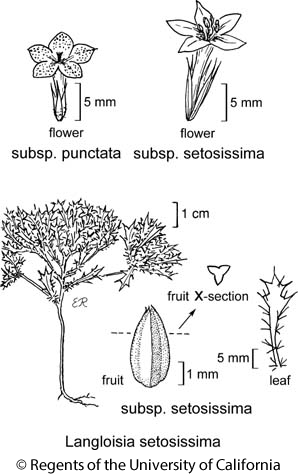 Flower: calyx lobes equal, bristle-tipped; corolla radial, funnel-shaped; stamens attached at or below sinuses, equal, exserted, pollen white to blue; style exserted. Fruit: lance-oblong, triangular in ×-section; outer wall of valve flat. Seed: gelatinous when wet. Chromosomes: 2n=14. Note: Self-compatible; generally cross-pollinated. Subspecies intergrade. Ecology: Common. Washes, flats, slopes, gravelly to sandy soils; Elevation: < 1800 m. Bioregional Distribution: SNE, DMoj; Distribution Outside California: to Nevada. Flowering Time: Feb--Jun Note: Smaller-flowered populations in western Idaho, eastern Oregon. Synonyms: Langloisia punctata (Coville) Goodd. Citation for this treatment: Dieter H. Wilken & Steven L. Timbrook 2012, Langloisia setosissima subsp. punctata, in Jepson Flora Project (eds.) Jepson eFlora, http://ucjeps.berkeley.edu/eflora/eflora_display.php?tid=51134, accessed on April 25, 2019.